Ottman and her team advise on strategic marketing and communications for policies, programs, and products that can help align city residents with zero waste. Their learning and expertise draw from 30+ years in the field of green marketing, zero waste, consumption culture change, behavioral science and mass communications, and focuses on the need to motivate consumers with the promise of living ‘Trash-free and Happy, Too’. 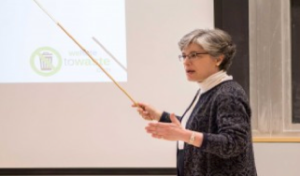 Jacquie Ottman shares insights on how to align urban residents with zero waste. A sought-after speaker at conferences and industry forums around the world, since 1989 Jacquie Ottman has been sharing positive strategies for aligning urban residents with zero waste, first as a green marketing consultant, and now, as a zero waste advocate focused on strategies for promoting sharing within communities, and for enhancing resident participation in multifamily recycling, reuse and organics collection programs. Learn more HERE. Invite Jacquie Ottman to share her insights about motivating a new generation of city residents to reduce, reuse and recycle, and to take other steps to align with zero waste, by helping them to live more Trash-free and Happy, Too.